So you would like to grow climbing roses in your garden but you are not so sure you have the expertise to grow them properly. No worries, growing roses is really not as difficult as many people believe and in this article we will take a few minutes to break down a few tips to help get you going. One of the first decisions you will have to make is where to plant your roses. Surprisingly this is the step where I have seen so many gardeners make mistakes that they come to regret later on down the line. Roses need a lot of sunlight in order to give their best performance, at least 6 hours worth. While there are some varieties out there that will do better than others in partial shade, the best performing roses are usually the ones that get 8 to 10 hours or more a day of full sunlight. So if you have to make a choice between sites, choose the sunnier one. Very few of us are blessed with the perfect soil in our gardens. For the few of you who are, congratulations and you may skip onto the next section because this doesn't concern you. For the other 99.9% of us, no matter how good we may think our soil is, it can always be improved in some way. If your soil has a high clay content like my area does, you may find that it will smother your plants. If your soil has an unusually high sand content, then it won't hold water well. Both of these conditions are poor for caring for climbing roses, but they are also easily corrected. Now there are a couple of ways you can go about this. If you really want to get technical you can play around with additives to try and achieve the optimum balance, or you can do what I generally prefer and go pick up some bagged organic compost from the local garden center. This stuff is inexpensive and is most often just what your soil needs to get back in balance. Till some into your flower beds and save a little to mix into each planting hole as well. The results are sometimes astounding! In most cases you can get specific feeding directions right from the grower who sold you your roses, and if not a quick google search of the variety is sure to find you the information you need. As a general rule of thumb however I've found that most roses seem to do well with three feedings each growing season. The first one should be done in early spring when the foliage starts to grow as this gives your roses a great start to the year. The second feeding is usually done during the first bloom to help give the plant a little extra "umph" as it's going through its bloom cycle. 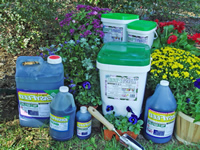 The third feeding seems to be best around mid-July or so and if you are investing your time deadheading the spent blooms, this feeding will help promote additional blooms throughout the remainder of the growing season. There are quite a few types of rose food out there so it can be difficult to choose among them. I have always had good luck with miracle-gro products and prefer them myself, but any all-purpose fertilizer will suffice when caring for climbing roses. 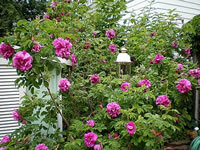 The water requirements when caring for climbing roses should not be taken lightly. Watering is a fine balance between giving your plants everything they need to survive, without overdoing it and killing them in the process. I've read a lot of articles on growing roses, not to mention my own experiences in my garden, and under nominal conditions, one good watering each week is usually all your roses require to stay healthy and strong. If Mother Nature isn't doing the job for you, then you'll have to supplement. One thing to consider is laying down a nice generous layer of mulch around the base of your roses. Not only will the mulch help to cool the soil but it also retains moisture and puts down a barrier between your plant's leaves and the bare soil underneath. Soil is a breeding ground for diseases and pests that can lay dormant from the previous year. During a heavy rain or watering, these undesirables can splash up onto the leaves of your plant and make it vulnerable to diseases. Also when you do water your climbing roses yourself, always try to water at the base. Never water from the top down as you are just adding unnecessary moisture to the leaves of the plant. Too much moisture can also lead to various diseases. 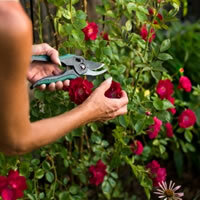 Pruning your climbing roses really isn't all that different than pruning other roses or plants. The first thing you need to do is remove any dead of diseased canes from the plant and remove them completely, do not allow them to just fall to the ground and rot away over time. With roses, you generally will be pruning in late winter or early spring, before the foliage opens up, so you want to try and shoot for an open center plant with as few canes crossing one another as possible. Sometimes this is difficult with climbers but one lesson I've learned is always take small bites. 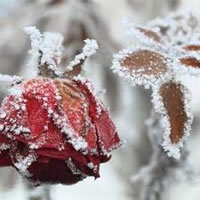 Don't allow the rose to grow unchecked for several seasons and then try to prune it all back at once. I've shocked more than one rose bush this way before I learned my lesson. You can train your roses to grow in certain directions by pruning back to buds facing the direction you want it to grow. Caring for climbing roses is not terribly difficult, but as with most things it does take practice to learn to do it right. Don't be afraid to get your hands dirty and get down to it!